Samsung's Galaxy series has been showing no signs of slowing down and Samsung's shift into the limelight of modern technology can in large part be attributed to the emergence of the world's most successful smartphone line. A winning combination of R&D, production, and marketing, the S5 and its predecessors have become a measure for an entire industry to go by. They say that excellence is contagious, and that's exactly where the LG G3 comes in. Crosstown rivals recently unleashed the G3 a whole two months after the S5, but did so with quite a splash. The G3 is the first device from a major manufacturer to sport a QHD screen, and it immediately ups the ante by rewarding those of us patient enough to wait until the second half of 2014 with a future-proof and robust competitor that can stand its own. They say the greatest minds in history were spurred on by their most competent rivals, and that couldn't be truer than in the case of these two tech giants. Let's see if the G3 has enough to make up for lost time; below are the key features that set each apart. Keep in mind those differences are on paper only and the advantage might shift from one side to the other in the actual tests that we are about to undertake. Bigger screen - 5.5" vs. 5.1"
Bigger camera sensor - 1/2.6" vs. 1/3"
Korean ingenuity has resulted in features we never imagined we'd see on a portable device - from heart rate sensors and fingerprint scanning to compact screens with resolutions greater than our TV at home. Smartphones have become the pinnacle of technology, an industry that sells in the millions and continues to grow each year. Now we'll be pitting the top devices by two Korean companies at different stages of success - one at the head of the pack with no chance of slowing down; the other clawing its way up, trying to make its mark without necessarily emulating someone else's. 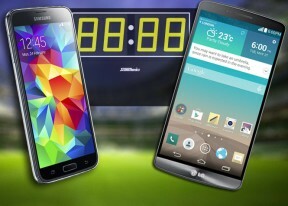 Does the G3 have enough to put LG in the fast lane, or will the Galaxy S5 prove too hard to dethrone? Let's find out. Watch your mouth. 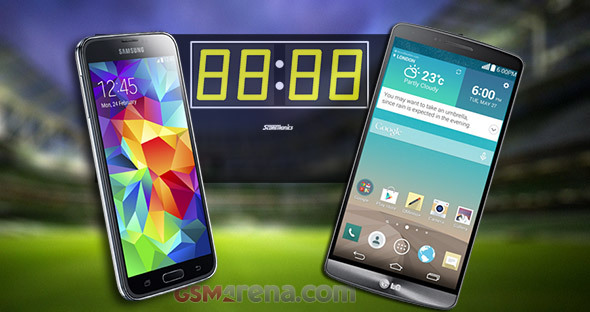 LG G3 is not a trash but s5 is. Stop talking shits without even touching the most amazingly perfect LG G3. Everything is perfect about it. From the QHD display to the elegant design. Don't you dare to trash on the G3! Got that? Plastic bezel in Galaxy S4 is an advantage, is like a security device for protect the display, mine has survived a lot of drops to floor.